Orders are usually shipped on the next business day. Please note that we do not ship on weekends, so orders placed on Friday do not ship until the following Monday. A tracking number will be sent to you via e-mail on the day that your order is shipped. Our standard shipping charges include both shipping and handling. If you select standard shipping, your order will be sent either by the U.S. Postal Service or UPS Ground, depending on the size and weight of your items. If you require faster delivery, you may select UPS 3-Day Select, UPS 2nd Day Air, or UPS Next Day Air at additional cost. For extremely urgent orders, we can ship on the same day. Please call us at (800)-881-8144 before 2 p.m. Eastern Standard Time and we will be happy to assist you. Orders that weigh less than three pounds are shipped via the U.S. Postal Service. Lighter packages are shipped by First Class Package service, while heavier orders are shipped by Priority Mail. Both services generally deliver orders in one to four business days. You can get specific delivery information by tracking your package at www.USPS.com. Please note that time in transit does not include weekends or holidays. UPS time in transit starts on the business day after your order is shipped. 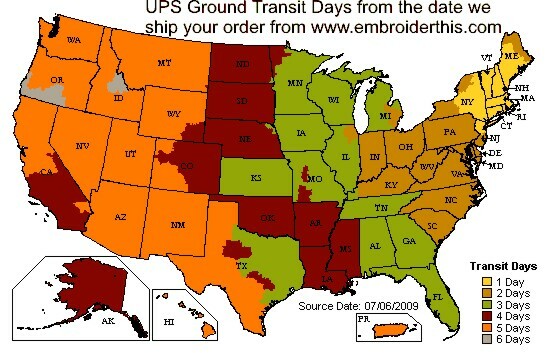 For example, if your order is shipped on Monday, UPS considers Tuesday to be the first transit day. You can get specific delivery times by tracking your order on www.UPS.com. UPS expedited services are available at additional cost. For these expedited shipping methods, the UPS rates will be displayed based on the order weight and your shipping address. Time in transit for expedited services are as follows: UPS 3 Day Select means UPS guarantees to deliver your shipment by the 3rd business day from the day your order is shipped. UPS 2nd Day Air guarantees your package will be delivered on the 2nd business day from when your order ships and Next Day Air is guaranteed to be delivered by UPS on the next business day from the date it is shipped. Order value $75 or more Free Shipping! For these expedited shipping methods, the UPS rates will be displayed based on the order weight and your shipping address. Please note: Your order is still shipped on the next business day. So, for example, an order placed on Saturday using UPS Next Day Air would be shipped on Monday, and arrive Tuesday. UPS 3-Day Select shipping is not available to Alaska or Hawaii. Orders outside the United States and Canada can be placed by e-mail. If you are interested in placing an international order, contact our customer service team by e-mail at info@embroiderthis.com. Please include the item numbers, item descriptions, price, color or size options, and quantities. Let us know the full shipping address and we will send a quote for your approval before proceeding with the order. Our quote will include order total, shipping costs, time in transit and payment instructions. We prefer PayPal for payment on international orders, and will send you a link for payment once you have confirmed the order and chosen your shipping option by e-mail. between 9:00 a.m. and 4:00 p.m.Eastern Time.